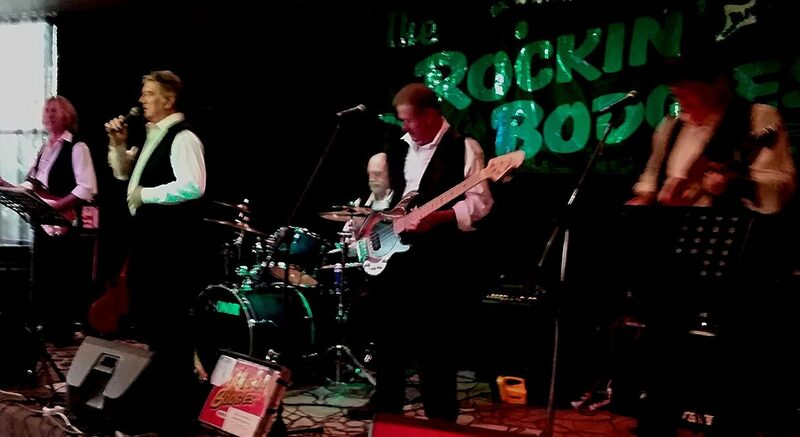 The Rockin Bodgies are one of Australia’s premier 50’s, 60’s and 70's dance bands. Formed in 1997, the current line-up consists of Mike Page on lead vocals, Robbie McGowan on guitar and vocals, Pete Dickson on guitar and vocal, Kieran McLaughlin on bass and vocals, and drummer Trevor Neal. A stalwart of Australia's highest profile Rock 'n' Roll festivals, the boys have 17 Wintersun and Cooly Rocks festivals under their belt. Finalist in the 2006 Australian Entertainer of the year awards, collectively the band has supported icons of rock including Thin Lizzi, Little Patti, David Bowie, John Farnham, Mondo rock and more. The Bodgies are in demand as a lively dance band, with colourful costumes and interactive stage presence they never fail to get the crowd on the dance floor. Queensland based the guys regularly play the club circuit, from Coffs Harbour to Bundaberg, you can catch them live most weekends and Wednesday nights at venues including Twin Towns, Carina Leagues Club, Sharks, Caboolture RSL and many more. Check out the gig guide to see where they will appear next.